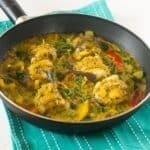 Cinnamon coconut fish stew curry recipe – Succulent paleo style fish fillets slow cooked in a flavourful herbaceous coconut sauce. 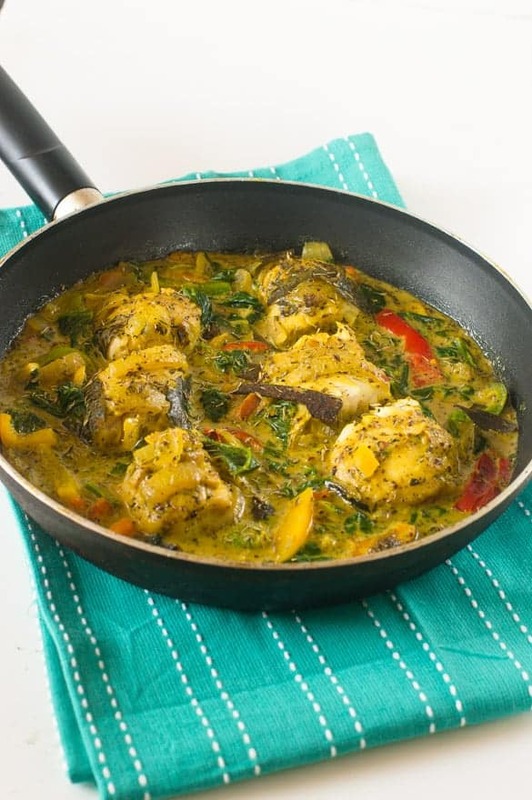 Here a simple but tasty cinnamon coconut fish stew curry with a difference, now you guys know I like to be adventurous with my food. Exploring different herbs and spices has my name written all over it. When I’m not making recipes on my website I’m usually in the kitchen experimenting with different spice blends. You know now that I think about it there is an element of truth to some of the stereotypes about foodies, quite similar to when people stereotype the geeks and nerds well us foodies are stereotypical in nature too. By stereotypical I mean by eat, sleep and think about food 24/7 not because we are greedy but because it’s our job/hobby and we are always thinking of ways to adapt or simply create a certain dish. It does take over our lives and we love to talk about all things food, watch the food channel and own tons of cookbooks. So now you guys know just how sad us foodies truly are, but we love it this way! Anyway now onto the cinnamon coconut fish stew curry recipe. 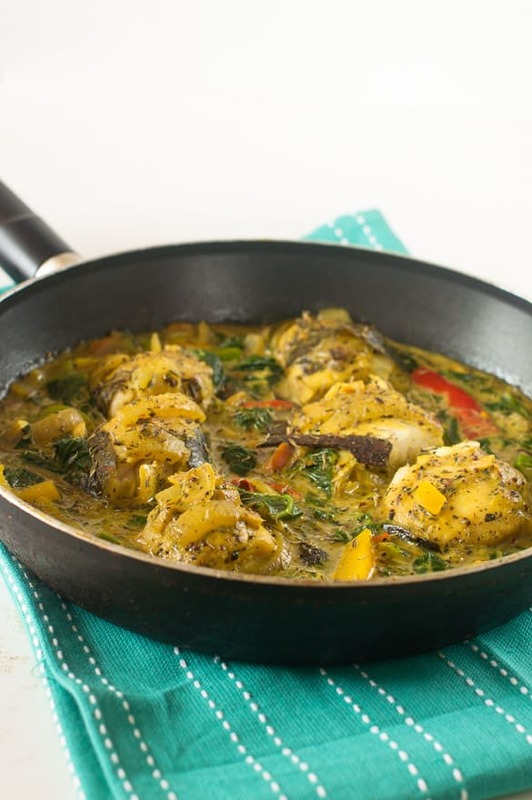 This stewed fish is my own creation with a balance of Indian and Caribbean flavours. In the Caribbean we are very fond of grilling, steaming and/or frying fish namely whole fish with the bones still in tact and eating our way around it. 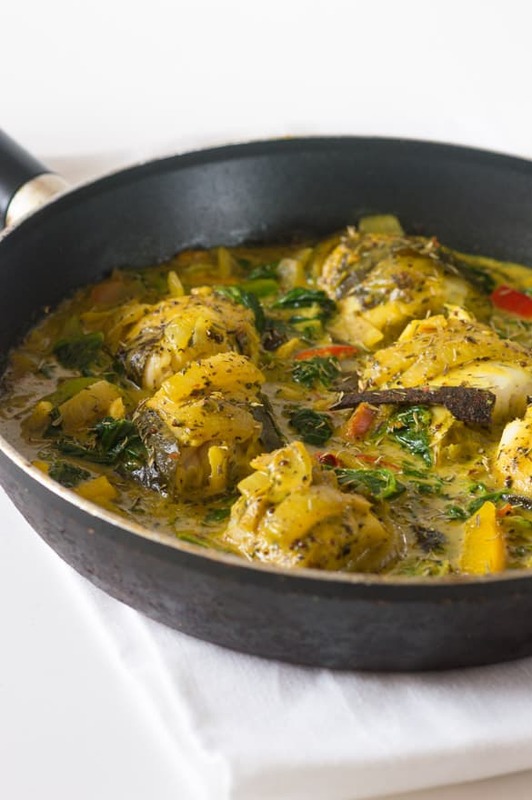 You will notice that I used fish fillet (hake) as opposed to using a whole fish or fish pieces with the bones, that is different from the norm. If you want you can use fish pieces like cuts of snapper instead, it would still work and not compromise the flavour, it’s merely a preference – boneless or bony fish that’s all. Now you will find the taste of this curry is very, very pungent, it’s has a plethora of warming notes – ginger, mustard seed and cinnamon are the stars of the show. The aforementioned really compliment the coconut milk, providing a depth of warmth. 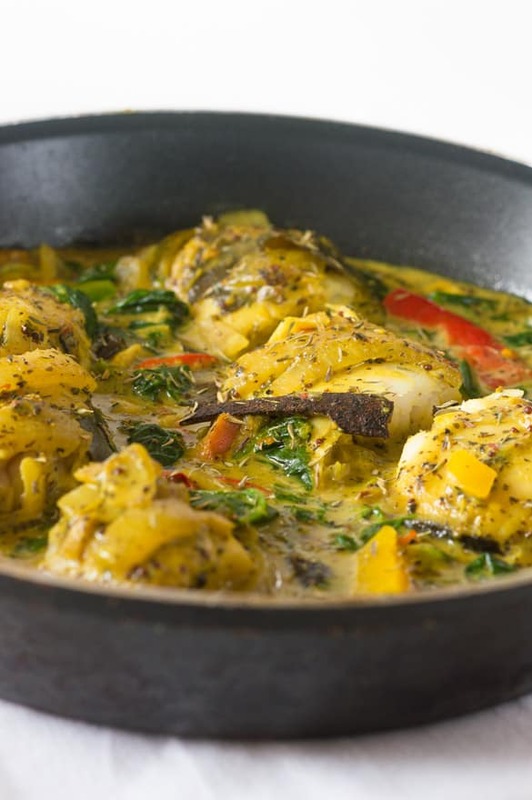 The Caribbean influence comes namely from the use of thyme, coconut, scotch bonnet, scallion and callaloo (familiar to spinach). There are a few ingredients that may be problematic to obtain. If you cannot locate any scotch bonnet a fresh chilli or harbanero pepper is just fine. How much pepper you use it accordingly to your tolerance for heat. Please remember the fiery taste comes from the membrane, if you want the flavour from the chilli only, simply discard the membrane or use the membrane partially for minimum heat. 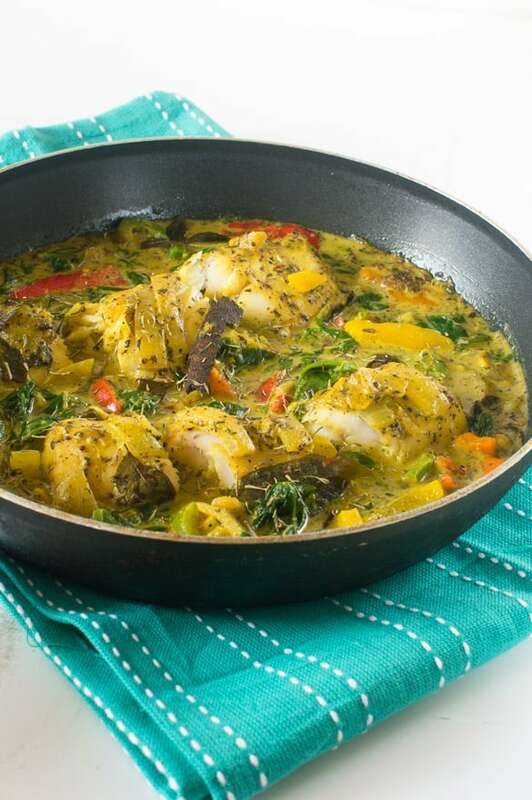 What can serve my cinnamon coconut fish stew curry with? Heat a generous amount of coconut oil in a large, heavy duty pan over a high heat. Proceed to add the curry leaves along with the onions, garlic, scotch bonnet and ginger. Reduce the heat to low and cook for 7 minutes, until the onions are soft, translucent and darkened. Sprinkle the remaining spices into the pan, stir and cook for another 2 minutes. Mix the tapioca with the coconut milk until it has completely dissolved. Pour the coconut milk into the onion/spice mixture and bring to a rolling boil. Finally add the fish so a 3/4 of the meat is submerged in coconut milk, then reduce the heat to low and taste for salt accordingly. Cover the pan with the lid and simmer for 20 minutes checking the pan periodically for adequate liquid levels. The coconut sauce will have thicken gradually over time. Finally add the callaloo and mixed bell peppers 5 minutes before the stew is done so they don’t absorb too much of the liquid. This is so totally up my alley. Love the sauce you created. This looks and sounds so great! I’m always looking for new ways to cook/season fish. Totally adding this to my list! Oh you must Karyn. I promise you won’t regret it. I love curry! this looks so awesome! Wowwww the flavor combinations you’ve come up with here really appeals to us. We’re Filipino by heritage so we grew up eating coconut everything lol. Can’t wait to try this! Awesome, glad this resonates with you. This looks very exotic, I’ve never tried anything like this before, so very curious! It’s actually the first time I have heard of callaloo. Do you have any tips on sourcing it? If I can’t find any are there any possible substitutions? Thanks for commenting Jolie. Spinach would be the best substitute if you cannot get hold of callaloo. A complex recipe that is worth it. Cinnamon does have a way of bringing all the other ingredients together to create complex multi layered flavor. Not sure if you used Ceylon Cinnamon but try Ceylon Cinnamon too, which is subtle like this fish and never takes center stage unlike Cassia Cinnamon. In Sri Lanka Ceylon Cinnamon which is mild is added to many curries to give it an almost savory taste which is mouth watering. Looked up Hake fish which apparently one of the best white fish. Wow. Did not know that. I like the Spanish Mackerel (also called Thora) found in Sri Lanka, which is also tasty. Thanks for a great recipe. Very well done. Thank you for commenting. No I did not use ceylon cinnamon, I am now intrigued and will definitely give it a try. fresh calalloo, could you please give me an idea of how much I should use? Many thanks. Sure no problem. I would recommend about 2 cups worth of frozen spinach will do the trick. Btw, are you following me on social media? I’m very active on Instagram, just to let you know.